As the year comes to a close, it’s time to get together for LATITUDE’s Holiday Print Swap! (Not to be confused with our Print Shop above). The rules are simple: Bring in one photographic print and head home with another artist's work. If you don't have a print to swap, no worries! Come hang out with us, and join the LATITUDE community in supporting amazing local artists. Maximum Print size 16" x 20"
NOTE: Print Swap participants that want to produce their work at LATITUDE before the swap will receive a free membership day rate ($10 value) and 20% off DIY ink charges! Or alternatively 15% off of Service Bureau. Service Bureau orders can be made through our online form (link to https://www.latitudechicago.org/service-bureau-request/). Questions? Get in touch at info@latitudechicago.org. Join us for an artist talk presented by LATITUDE’s November Artist in Residence Jessica Harvey! Harvey will provide an overview of her practice and discuss the challenges, rewards, and obstacles in working with both personal and institutional archives. During their residency, Harvey has worked to scan and reproduce piezography prints of the series Ashes to Ashes, a project utilizing intimate aspects of the physical body without revealing the actual human form. Following this presentation, Harvey will be releasing two new photo zines produced during their residency. Zines will be available for purchase at this event. Harvey will be producing work prints specifically for this event and invites the community to engage with this work in person. Read our Q&A with Jessica here. Jessica Harvey is a Chicago-based artist who explores the myths we create for ourselves and nature while trying to preserve a more desired history. Harvey received an MFA in Photography from Cranbrook Academy of Art and was awarded a Fulbright Grant to Iceland. Harvey has attended residencies at Ox-Bow, Wassaic, MASS MoCA, ACRE, Anderson Ranch, Byrdcliffe Arts Colony, Hardesty Arts Center, The Luminary, and Vermont Studio Center. She has participated in group shows at the Urban Institute for Contemporary Art (Grand Rapids, MI), Johalla Projects (Chicago, IL), The Center for Contemporary Photography (Detroit, MI), and the Cranbrook Art Museum (Bloomfield Hills, MI). Recent exhibitions include shows at The Wassaic Project (Wassaic, NY), Trestle Projects (Brooklyn NY), Heaven Gallery (Chicago, IL), The Luminary (St. Louis, MO), Good Weather (Little Rock, AR), and ACRE Projects (Chicago, IL). 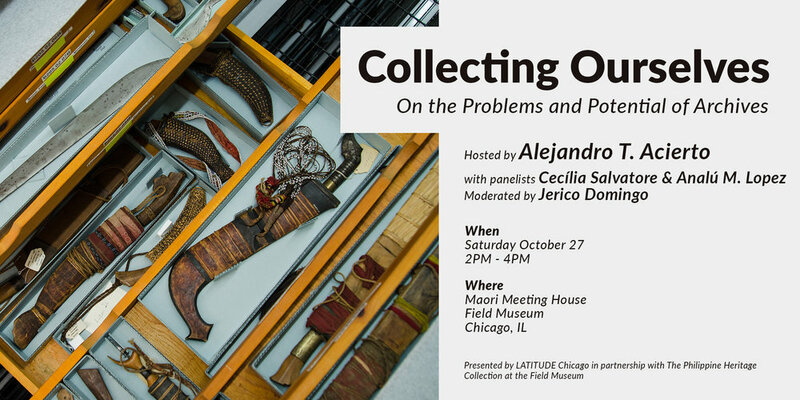 Join us for a public discussion on contemporary archival processes presented in partnership with the Field Museum’s Philippine Heritage Collection. Panel participants include artists, educators, and archivists who are interested in documenting oral traditions and re-examining our current systems of preserving cultural memory. On view will be a selection of objects curated by Alejandro T. Acierto from the Museum’s Philippines Collection highlighting the practical and theoretical aspects of data collection. Admissions to the Museum will be waived for those who RSVP in advance Please be sure to include the names of everyone in your party when you RSVP. RSVP at the Eventbrite link below. This event will be held at the Maori Meeting House Ruatepupuke II inside the Field Museum. This gallery is located on the west side of the building, just beyond the Regenstein Halls of the Pacific, on the upper level. We ask that you please enter through the South or West entrance of the building. Upon your arrival, please let the security personnel know you are there for this event and ask for the "Marae Gallery" for directions. Paid parking is available in the Soldier Field garage. The Museum is also easily accessible via public transportation, using either the 146 Inner Michigan Drive to Museum Campus bus, or the red/green/orange line Roosevelt exit of the L.